We can help you meet your weight loss goals through advanced treatment paired with ongoing support and encouragement. If you’re looking for a way to control your weight and live a more healthy life, our team at the Southcoast Center for Weight Loss is here to help. We have all of the tools you need to succeed and meet your weight loss goals, and we’re the region’s leader in weight loss surgery. 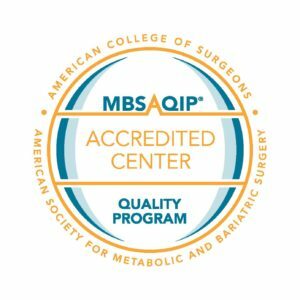 Our comprehensive services include everything from pre-op education to ongoing post-op support, and they are implemented by an expert team of physicians, surgeons, nurse practitioners, physician assistants, dietitians, licensed social workers and staff who have helped more than 7,300 patients. Learn more about our weight loss program by reading our newsletter, attending an information session, viewing our online seminar, or you can schedule a consultation with one of our bariatric specialists in southeastern Massachusetts by finding a physician near you. Body Mass Index is one helpful indicator to see if you’re eligible for weight loss surgery. Find out more about eligibility for our program. At the Southcoast Center for Weight Loss, patients are in regular contact with experts in nutrition, as well as nurse practitioners, physician assistants and licensed social workers who run weekly support groups. Our bariatric team also utilizes the newest technology in minimally invasive weight loss procedures to give our patients a range of options when it comes to losing weight. Southcoast Health Weight Loss Center is celebrating the more than 7,500 of you who have changed your life through weight loss surgery! Learn more. For those wanting to learn more about our weight loss programs, we offer free educational seminars every month on bariatric surgery. Registration is required. Please view our event calendar for upcoming programs, then call 508-973-1850 for further information and to register for a free seminar. You may also watch the seminar online. Hear what our patients have to say about the Weight Loss Surgery program at Southcoast Health. Would you like to be our next success story at the Southcoast Center for Weight Loss? Contact your nearest location today to get started. The Southcoast Center for Weight Loss provides a reliable weight loss program for patients in Fall River, Dartmouth, New Bedford and Wareham, MA, as well as nearby areas in RI.